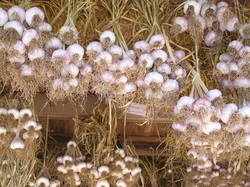 Hardneck garlics contain a central stiff stalk called a scape that has a bulbil capsule at its topas the garlic matures. A bulb or two bulb each of some stronger Tasting and hardneck garlics, such as: Music, Georgian Crystal, Killarney Red, Carpathian, Chesnok Red, German White, Romanian Red and Spanish Roja, etc. 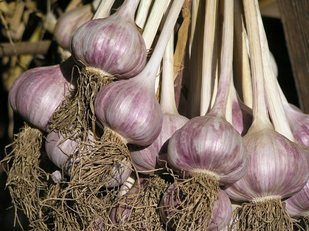 The hardnecks are strongly flavored garlics and are usually the best ones to use in cooking most "ethnic" dishes because they were originally made with strong, flavorful garlic. The hardneck varieties usually do well up north but are "iffy" at best in the deep south.